Okay – so there are actually 75 tips (but I'm only sharing 4) – and they all come from the best-selling and most amazing college success book by Cal Newport (who wrote the book not too long after he graduated college). 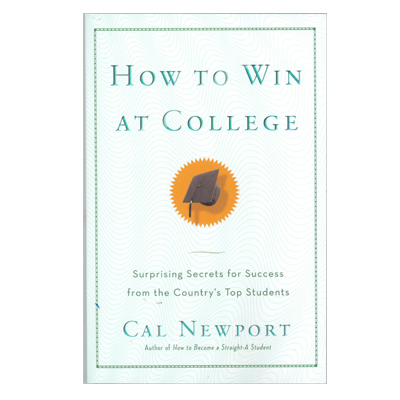 Cal writes the blog Study Hacks and his book How to Win at College is a best-seller. I have been wanting to check it out for a while now and after a student asked me to review and share the best college success books I knew I had to start with this one. It’s a short read which many of you will love (I read it in one day) and it is jam-packed with the best college success tips from real students who have managed to build outstanding college resumes, win the best scholarships/awards, maintain incredible grades, and have a great and relatively stress-free college experience. The secrets to your best and most rewarding college experience are in this book. There are some books you read where with every page turn your brain goes wow. Wow. WOW. WOW!!! And if you put those "wow moments" into action your life changes dramatically. This will happen to you with this book. And then there are some books that explain things you always thought or did but weren’t sure if they were also applicable to others. Since I was a successful college student who wasn’t a high IQ-genius and always wondered why other students were stressing so much when I turned the pages of this book my brain went yes. Yes. YES. YES!!! It was so exciting to realize that I am right when I tell my students to never pull all-nighters, to relax before a test, and to dress nicely. Of the 75 tips in How to Win at College I did all 75 throughout my community college and university experience. And those tips directly led to all of my successes without the stresses. I don't share this to brag but to let you know that this works and that YOU can be a stand-out student no matter where you are in your life right now. There are many of the tips you may be doing already too. But if you’re not earning all A’s, if you often feel stressed, if college seems so hard, if you’re not getting invited to the top honors societies/programs, and/or if you aren’t winning scholarships and awards then this book can change your life and will show you how to easily do all of these things. And it’s not about being a super-genuis. And it’s not about being a book nerd locked up in the library. It’s easier and more amazing than you think. So as I was reading I tried to pick my top 4 favorite tips for the Weekend 4Cast and ended up with 16. So hard to choose! But alas I did choose because you need to get the book yourself to find out about all of these life-changing tips. Cal says it best: “losing students don’t think they have enough time to be involved with extracurricular organizations. Average students join extracurricular organizations. And winning students run extracurricular organizations” (p. 25). I never thought I could run an organization, but after trying a smaller position first and coaxing from the amazing friends I made I decided to run. Being the President of Phi Theta Kappa was the most incredible experience and let to my first airplane ride and winning the $110,000 Jack Kent Cooke scholarship. You can run a club. It’s not as hard as you think. And you’ll find it can actually be quite fun. What?! I know – right? This seems crazy at first but it makes total sense. Cal suggests instead of to-do lists that often make you feel like you can never get it all done in a day that you schedule your day using time blocks. I won’t give his secret away here but I will recommend my favorite tool for blocking out time for specific tasks/projects: Google Calendar. Free, easy, and amazing! You can also set SMS reminders so your phone will remind you when you have to do something or when projects are due. 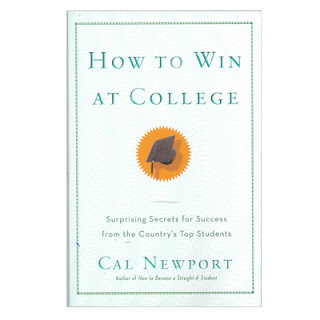 In this tip Cal encourages you to think about “defying the norm” and how to evaluate if what you are doing right now will lead to earning the best awards, scholarships, and jobs (p.135). This tip resonated with me because my mission statement is to help students to not get comfortable with average, to realize they are so much more than average, and to motivate them to rise above average. That voice in our head saying we can’t do something is powerful. Just as powerful, however, is the voice that tells you that you can. Often we need others to remind us of that voice. To remind us that we are worthy, that we have potential to do more than we think. But we can’t always rely on others. Crush that negative voice in your head with YOUR voice. Whenever I hear a student saying “I’m gonna skip class” I plug my ears and go lalalalala as a joke and then tell them to GO TO CLASS. It shocks me how often students skip class and how they don’t think it is a big deal. Class is where you learn what material is important to the professor, have the ability to ask questions to make sure you understand the material, and where you take the most important notes that will help you on exams. Attending every class will make your life easier and grades higher. So in conclusion, buy this book. But of course you must do more than shell out $6.77. You must read it. And then - you must do it. And be sure to check out Cal's other amazing books (I'll sure will be!). Newport, C. (2005). How to win at college: simple rules for success from star students. New York: Broadway Books.